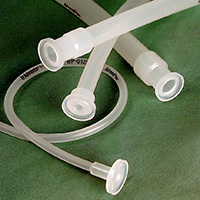 Single use manifolds are manufactured by molding straight sections of AdvantaFlex tubing with connectors of various styles such as T's, Y's, and Tri-Clamps®. 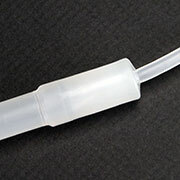 Most molded connectors provide a seamless transition for a continuous, unrestricted, leak-proof flow by eliminating barbed fittings. 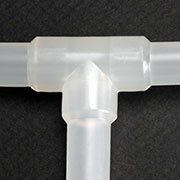 AdvantaFlex molded TPE manifolds are custom made to your specifications and available with validated sterility assurance of 10-6 log reduction per ISO 11137 method VDmax. Choose from the connection options listed here or suggest your own. 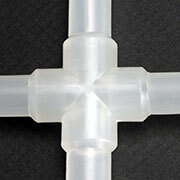 AdvantaPure's manifold connectors are not intended for implantation or continuous steam applications. Size range: .063” I.D. x .188” O.D. to: .500" I.D. x .750" O.D. to: .375" I.D. x .625" O.D. and other sizes are in development—talk with a representative for details. 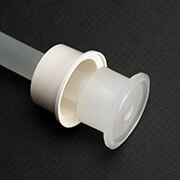 Excellent weldability and sealability allows leak- free, sterile connections for filling and sampling applications. 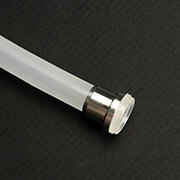 AdvantaFlex is compatible with all portable welding and heat-sealing equipment. 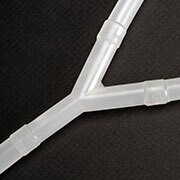 Single-Use AdvantaFlex tubing with molded mini Tri-Clamp® ends are ideal for aseptic transfer and processing applications. 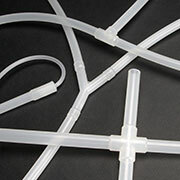 The TPE tubing is overmolded with a USP Class VI polypropylene mini Tri-Clamp to form a smooth fluid path. 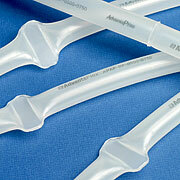 Available in a variety of tubing sizes and lengths for your biopharma fluid transfer applications.